We are expanding our range with know-how for the overall business including network, solution and consulting. 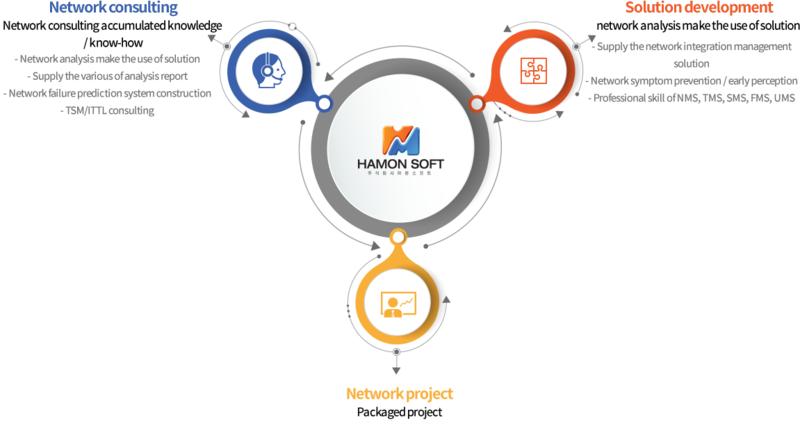 HarmonSoft is a company specialized in development of IT infrastructure, integrated control solution. We have developed our original solutions through numbers of network infrastructure management projects so far. Each solution delivered to companies offers pre-diagnosis of network malfunctions and various forms of reports. We shall continue to make an endeavor for customer satisfaction with the best teamwork and creativity. We will not stop our challenge to the best values with ceaseless passion keeping motivating us. We pursue developmental change and innovation through growing creative minds with autonomy, participation and communication as bases. We’ll try our best to achieve our goals with great teamwork based on consideration for each other and a respective atmosphere. We aim to be a company that strives constantly with the best teamwork and creativity aiming at customer satisfaction. We will not cease the ceaseless challenge to the best value through the motivation to oneself with the constant passion. Based on autonomy, participation, and communication, we develop creative thinking and pursue progressive change and innovation. We will do our best to realize our goal by teamwork based on mutual consideration and respectful atmosphere.